In 672 the Saxon king Caedwalla gave the lands where the castle now sits to Saint Wilfred, the first bishop of Selsey. Eventually the property passed to the bishop of Chichester. Around 1100 Bishop Ralph Luffa of Chichester embarked on an ambitious building program in Sussex. Not much is known of the period until 1377, when King Richard II granted a license to crenellate to Bishop William Rede. the bishop then built the castle’s tremendous curtain wall. Not until the Civil War did Amberley suffer the ravages of battle. When the Royalist, John Goring, who lived in the castle in 1643, declared that he wasn’t going to pay any more taxes to those “odious” Roundheads, Cromwell’s soldiers laid the castle’s Great Hall to waste. The 15th duke of Norfolk bought the property in 1893 and began the long restoration work that is being continued by the present owners, the Cummings. When asked to come up with a list of over-the-top luxury castle hotels for the Discovery Travel Channel’s Uber Guide Top 10 Castle Hotels program, Amberley was deservedly on my list. A member of the prestigious Relais & Châteaux hotel association, everything is fit for royalty. In 2007, owners Martin and Joy Cummings sold the property to the von Essen hotel group, which may or may not affect the level of personal service the castle has been noted for. The castle’s dining room is quite formal—jackets and ties for the men. If you feel like eating in an informal atmosphere, wander into the village. From London, take A24 south. Turn west on A283 to Storrington. In Storrington, continue southwest on B2139. The castle is on the right and is marked by a very small signpost. Try to arrive during daylight. At midnight the 2-ton portcullis is lowered, and special arrangements must be made. Direct train service from London. The hotel will pick you up at the station with prior notice. Yes. Civil ceremonies. A church is available in Amberley Village. Exclusive use is possible. Between the South Downs and the expanse of the Amberley Wildbrooks—a preserved wetland and nature reserve—the massive fortified castle of Amberley welcomes you to a genuine castle experience. The only threatening presence here nowadays comes from the peacocks who stand sentry duty on the walls and grass-covered moat, which now serves as a croquet lawn. Through the portcullis, you enter a large courtyard where a stone walkway leads to the hotel. Each uniquely decorated guest room bears a medieval ambiance and is named for a Sussex castle. Rooms are furnished with antiques, brass or four-poster beds, and lovely shades of fabrics. 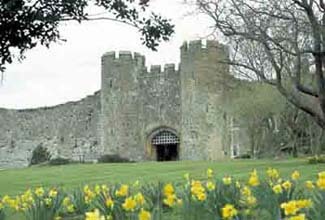 The Herstmonceux and Pevensey rooms each have a secret doorway leading to the battlements, and the Arundel and Amberley rooms have gas fireplaces and stunning windows set in stone recesses. The Chichester Room, not only has a fireplace and beamed ceiling, but a six-foot-long four-poster bed and an enormous bathroom with an outstanding view from its oversize whirlpool bath. Five of Amberley’s suites, named the Bishopric Suites, are found in a 17th-century stone building within the dry moat. They have views of the castle walls, gardens, or portcullis. In the barrel-vaulted Queen’s Room Restaurant, you can feast on classic French and traditional English cuisine served on Wedgwood china and Dartington crystal. Lancet windows provide views of the graceful English countryside. An enchanting, thatched-roof tree house, nestled in the bough of an oak tree, is reached by a rope bridge. Named the Mistletoe Lodge, it is a divine spot for a romantic picnic or dinner for two.